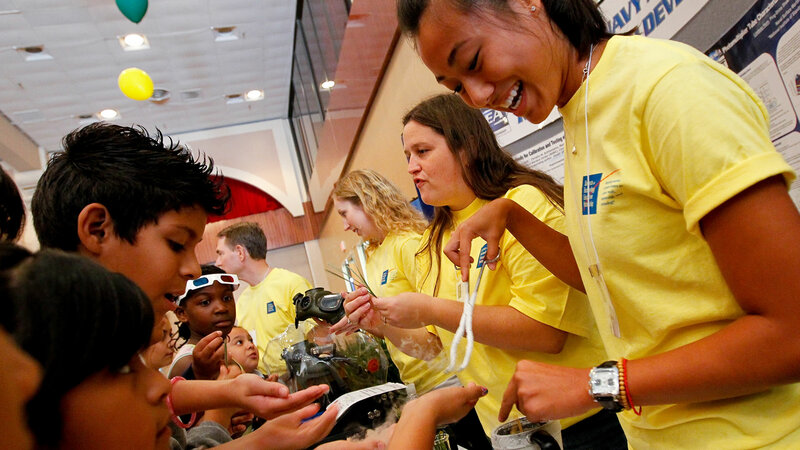 The Science and Technology Education Partnership (STEP) is a volunteer organization dedicated to inspiring students to pursue careers in science, math, engineering, and technology. STEP sponsors an annual conference for K through 12th grade students and their teachers. These conferences have been a success because of the enthusiastic support of volunteers. A STEP Volunteer is an individual that is interested in promoting science and technology for today's youth in hopes of inspiring interest in the fields of science, technology, and mathematics. This individual is willing to unselfishly give their time to help plan, organize, and execute these conferences. There is a wide spectrum of need including assisting with hands-on science experiments, interaction at technology exhibits, keeping the day organized, and supporting the needs of the teachers' conferences. Tour guides are responsible for taking the students through each of the "Zones" and making sure we don't lose anyone. FYI, we're expecting over 3,000 students at this conference. These volunteers would help to ensure that the exhibitors have what they need during the conference, and assist in the student rotation from zone to zone. Some vendors have requested assistance manning their booths during the conference. We're looking for engineers, scientists, and technical folks to help us assist them. One of the zones consists of a science show. We need three people to assist the Scientists in the operation of their show.